Once only available in print format, the classic book on helping companion animals to go vegan is now available on DVD-ROM. 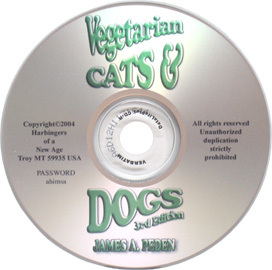 Vegetarian Cats & Dogs, written by the nationally recognized authority on meatless diets for cats and dogs, James Peden, tells a fascinating story. Starting with the amazing story of Little Tyke (a modern day vegetarian lioness), it follows modern day "Little Tykes" as new age felines (and dogs too!) live happily and healthily without meat. This book on disc features 11 chapters on vegan companion animals, including sections on necessary nutrients, shopping for ingredients to make healthy vegan food for your animals, recipes for cats and dogs, answers to questions on common concerns, health information and much more. This DVD-ROM contains the full 236 pages of the printed book, now with updated information and color photographs. $16.99 per copy. From Pamela &amp; critters of Erie, Pennsylvania on 9/5/2012 . This has been my nutrition bible for 14 years now! My 3 very healthy dogs enjoyed plant-based diets based on the well-researched info and recipies in this wonderful book.